This textured swirl cross pendant from Apples of Gold Jewelry is a pendant that is both stylish and unique, and makes a perfect piece of jewelry for those who want to wear a symbol of their faith. The 14K yellow gold pendant features a textured cross, covered with a bit of a swirl to add additional character and charm to the pendant. The yellow gold cross pendant measures 26mm in width and 53mm in length, and would look wonderful on an assortment of beautiful chains, also available from Apples of Gold Jewelry. 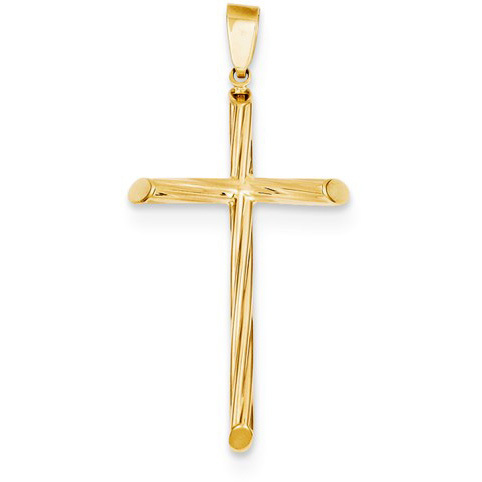 We guarantee our Textured Swirl Cross Pendant in 14K Yellow Gold to be high quality, authentic jewelry, as described above.